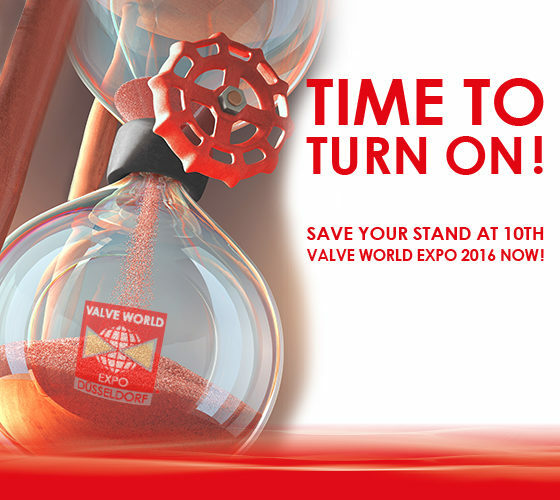 Save your stand at 10th Valve World Expo 2016 now! You missed the application deadline for Valve World Expo 2016? No problem! Even now you still have the opportunity to save your stand at the 10th Valve World Expo and Conference, the leading international trade fair for industrial valves and fittings, which takes place from 29th November until 1st December 2016 in Düsseldorf. Take advantage of being present at the leading business platform for the industry and its users to make great international contacts and new business deals – don’t miss Valve World Expo 2016! Secure your success at Valve World Expo 2016 now and please let us know which stand space we may reserve for you. In case of any further questions, please do not hesitate to conatct us again. Messe Düsseldorf GmbH processes your personal data. The data protection regulations of Messe Düsseldorf GmbH hold information in closer detail to this subject and are available under www.messe-duesseldorf.de/privacy. You may at any time object to the processing of your personal data either on the aforementioned website, via e-mail to privacy@messe-duesseldorf.de or via postal mail to Messe Düsseldorf GmbH, VG-R, PF 101006, 40001 Düsseldorf, Germany. Should you no longer wish to receive our newsletter, please click here.